While most Christmas presents will be forgotten almost as soon as the wrapping hits the floor, there is a festive gift that will make a real difference in the lives of your loved ones right now – and potentially in years to come. While we help people to write their Wills and Estate Plans, we also often advise on Lifetime Gifts – substantial financial gifts to friends and family. As well as helping out family members who need it, wise use of Lifetime Gifts can also reduce your family’s exposure to Inheritance Tax in years to come. You can give gifts of over £250 up to a cumulative total of £3000 within any tax year and those gifts will no longer be counted as part of your assets for tax purposes. You can give gifts totalling more than £3000, but those will be counted as part of your estate, should you pass away within the following seven years. To find out exactly how this works, see our previous article: The 7 Year Rule – Inheritance Tax and Lifetime Gifts. You can give as many gifts of up to £250 as you like! Merry Christmas! There are a few types of larger gifts that are exempted from continued tax liabilities, including gifts given on marriage, and donations to charities or political parties. So if a member of your family is getting married and you’d like to help with the costs of the wedding, or contribute to a deposit on a new home, or simply a cash gift to set them off on their new life together, you could make this a Christmas gift to really remember. For something you give to qualify as a gift, it must be given freely and without conditions. You cannot continue to derive any benefit from the gift (ie, signing the house over to your adult children, but continuing to live there rent free). Even if you are confident in giving large gifts that you will likely survive another seven years – or have an insurance policy in place to protect your family from IHT liability if you don’t – be aware that gifts given to your adult children or grandchildren can be claimed in the event of a divorce, or become joint property of a future spouse should your descendants marry or remarry. If you would like to ringfence your gifts for specific family members and protect them against changes in circumstance, then you may want to consider setting up a trust, rather than giving a direct gift. This can also help to protect your family from Will challenges and tax liabilities. For more information on Trusts, when they are appropriate and what they can be set up for, please do read our free guide, ‘What is a Trust, and How Will it Protect Your Loved Ones’. Whatever you decide to give, we hope you enjoy a very Merry Christmas, and a prosperous and peaceful New Year. Here’s to the future! 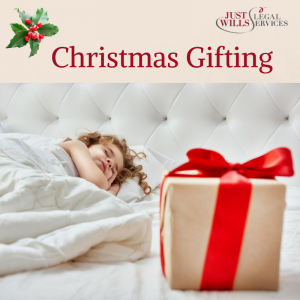 If you’d like to book a free consultation with one of our legal experts across the UK, book online or call 01342 477 102 and quote ‘Christmas Gifting‘.